Our family-owned and operated business has earned a reputation for honesty, integrity, and a commitment to customer service. You’ll find our team friendly, prompt, and reliable, and our craftsmanship exceptional. Our masonry work is handled by professional team members with years of experience and training in the field. Contact us today for more details about our masonry offerings, listed below. Block retaining walls can be a dependable and enduring structure within your property. We’ll take all necessary steps to ensure we’re choosing the best masonry solutions for your home or business, and do our finest work for you each and every time. Gulf Coast Environmental Contractors offers a large variety of products and services, and our masonry work is no different. Working alongside you, we’ll discuss design, functionality, and budget when it comes to your masonry projects. Our structural block walls are always installed with expert care and precision. For decorative flair, brickwork looks stunning in a home. Stately, timeless, and classic, brick is long-lasting and durable and never goes out of style. 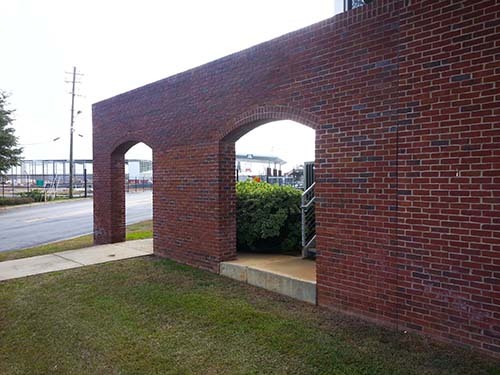 We can erect sturdy brick columns and attractive arches to add to your home’s ambiance, in both the exterior and interior portions of your property. Brick steps have a look that is austere and sophisticated. They add a great touch to any type of property. Brick steps should always be crafted and installed by a trained professional to ensure proper construction. Lost, cracked, or broken bricks? Not a problem. Call us at Gulf Coast Environmental Contractors and we’ll promptly arrange a service appointment to conduct swift and thorough repairs on any masonry work your property requires.